The mor fans the better. PROJECT UKULELE HAS A NAME! Yooka-Laylee is confirmed to be the game's name! They’re not real human beings, but they are our new heroes. 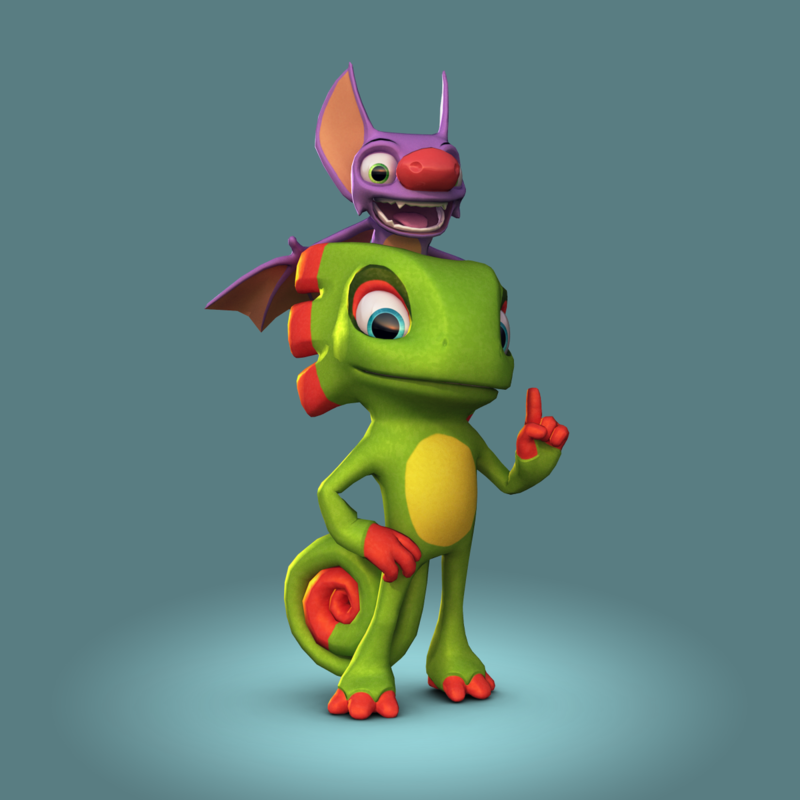 Meet Yooka and Laylee, the buddy duo set to adventure in our aptly named debut project Yooka-Laylee, coming to Kickstarter this Friday! Dreamed up by character artist Steve ‘don’t call me Steven’ Mayles – the man behind Banjo, Kazooie and the rebooted Donkey Kong family – we think the bat ‘n chameleon (we’ll let you guess their sexes) are our most inventive protagonists yet, and we’ll tell you just why we’ve deemed that over the next 24 hours. Starting right now IGN has the ‘scoop’ (we’re assured that term is still used) on the first ever Yooka-Laylee gameplay footage and feature details. Head over there for ‘the skinny’ and when you’re done visit our brand new game page to see some beautiful artwork. Tomorrow we’ll publish loads more Yooka-Laylee media (will there be David Wise and Grant Kirkhope tunes? You bet your pedigree gerbil there will be) alongside an interview with their father, Mr. Steven… sorry, Steve Mayles himself. And then at 5pm BST on Friday it’s the big one, the launch of our Yooka-Laylee Kickstarter campaign. When we first discussed this project the reaction was immense. You flocked to our shop doors like eager amiibo scalpers, and your mouths were full of requests. You told us you wanted Yooka-Laylee (or whatever it was called back then) to be the best game it could possibly be. You said you wanted sprawling, gorgeous worlds to explore, tons of smartarse characters to meet and inventive moves to learn… and you wanted to do it all on your gaming platform of choice. When we launch our Kickstarter in less than 24 hours, you can help us tick all of those boxes and more. Together you can help our team create the game they’ve dreamed of making – and you might pick yourself up some cool swag in the process. Yooka is the chameleon and Laylee, the bat, and if the dynamic and style seems familiar it’s because they were created by Steve Mayles, the same character artist who designed platforming icons Banjo and Kazooie and the modern Kong family during his time at Rare. Using their unique abilities, the two characters work together to fight enemies and traverse the world around them. Yooka, being a lizard, uses his tongue like a grappling hook, while Laylee can pick up its partner and fly for a short period of time or unleash a sonar blast. The duo have a variety of moves to draw upon. You can see the characters in action in the news video up above. 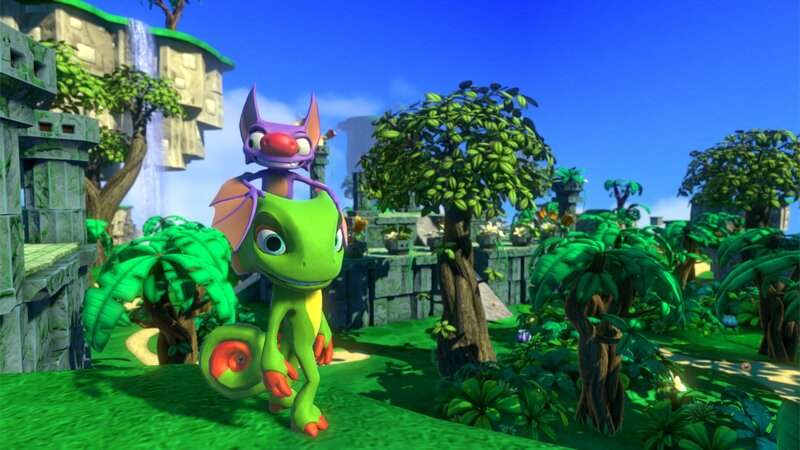 Formerly known as Project Ukulele, Yooka-Laylee is the first game from Playtonic Games, a new studio formed by several veterans of acclaimed developer Rare. All footage in the news video above is the product of three month's work. 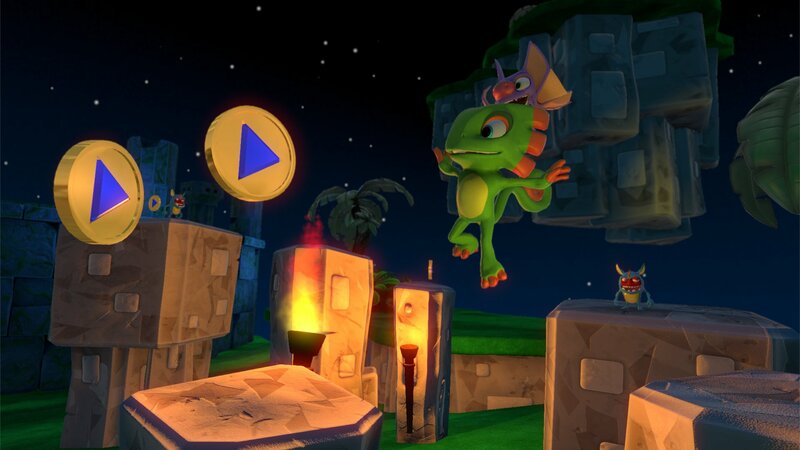 Playtonic is launching a Kickstarter for the project on May 1st, with all backers able to pick up the finished copy for £10/$15. There are also plans include extras like soundtracks, art books, and a special '64-bit' special edition, a callback to the team's N64 pedigree. Full details will be revealed tomorrow. 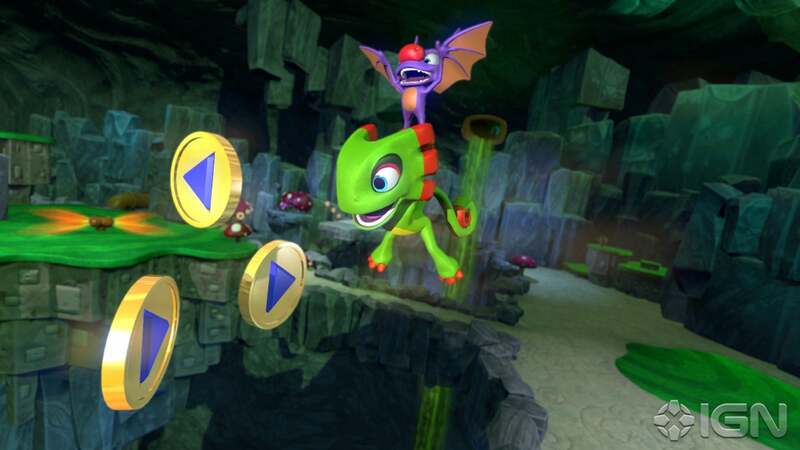 If funded, Yooka-Laylee will be released on Windows, Mac, Xbox One, PlayStation 4, and Wii U. The exact timing of each version is contingent upon the success of the Kickstarter campaign and its stretch goals. 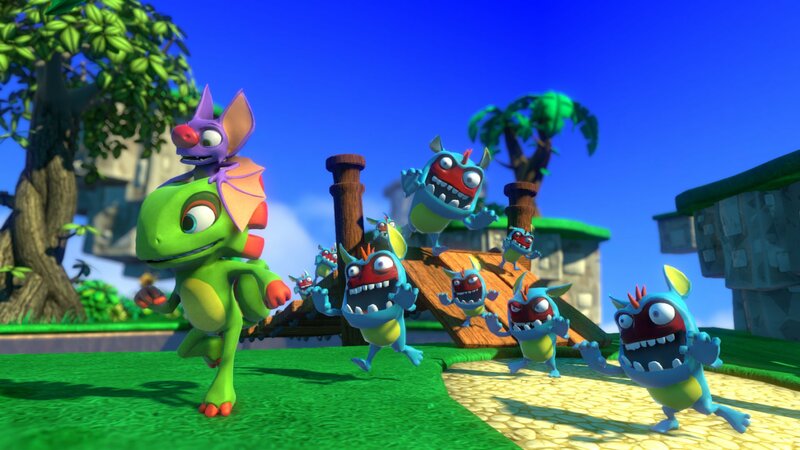 "If funded, Yooka-Laylee will be released on Windows, Mac, Xbox One, PlayStation 4, and Wii U. The exact timing of each version is contingent upon the success of the Kickstarter campaign and its stretch goals." Promotional Image for the Kickstarter! The full details of the Kickstarter, as well as Grant Kirkhope (and possibly David Wise) composed music will be released tomorrow. Some music is available on the Kickstarter page. Donate $8, get your name in the credits, $15, get a free digital copy and your name in the credits. Some of the goals were instantly reached. It's pretty damn good that they reached 600,000 pounds already with little to no marketing. This project will definitely reach its target. Luma Party, are you backing this? They should probably do more stretch goals. They already cleared out more than half on the first day. And we STILL have 46 days to go. Ironically, that will be the day E3 2015 starts. The game also now has a tentative October 2016 release. This whole thing is promising. If I had the money, I would back this up... sigh. I am really convinced by everything. The music samples are amazing too. They give me those nostalgia feels, you know? I'm going to guess that by the end of the day (here), they'll reach the 900,000 mark. Though, I wouldn't be surprised if they reached the 1 million mark. Here is an MCV Interview with Gavin Price, he says he's pitched the idea of Yooka-Laylee amiibo. It's already down to the last 2 stretch goals and it's still only day 1? Wow, the anticipation is real for this. Might even pledge something myself too depending on whether or not they reach the final stretch goal or not. I'd still be wary about this project. It's great that it's exceeded it's goal already, but 175000 pounds for a full 3D game seems very, very low. Kickstarter and video games don't have the best relationship, not to mention is game is already hyped to s*** and people are going to be expecting amazing things from it. Granted, their presentation is very well done and what they've shown on their website and page is fantastic. Also they show a cost breakdown which includes taxes so that's a sign it's not being run by inept idiots. No doubt this game's funding will be in the multi-millions. It'll hit all it's stretch goals probably sometime tomorrow and possibly be at 2 million within a week. This is probably going to turn out like Mighty No. 9 where they make it way past their original goal. Hopefully the just don't do the bs Comcept has been doing post their initial crowd funding campaign. ^And some David Wise music for this. (I don't know to get videos right on the post, maybe Vip can teach me). Yeah, they've added new goals.